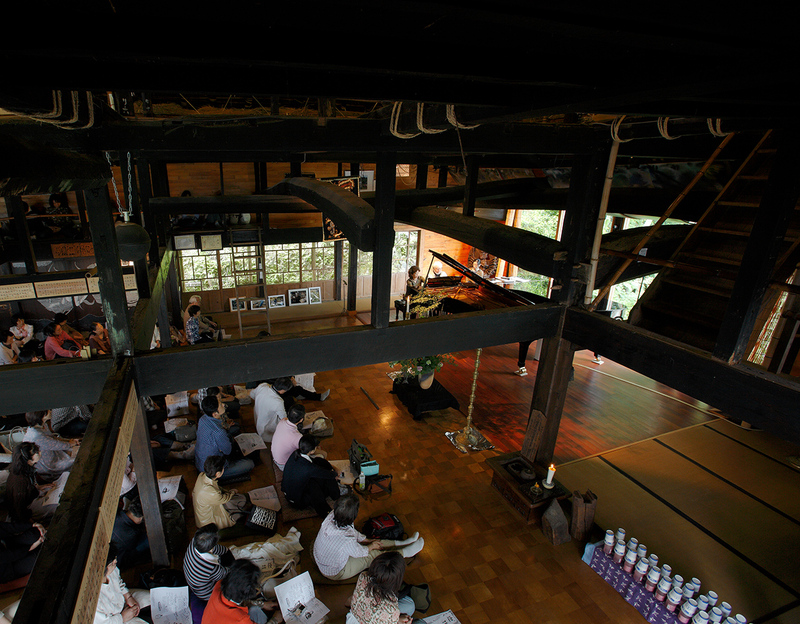 The Seiler Piano Duo (Ernst Seiler and his wife Kazuko) had given recitals of music for one piano, four hands, in their re-built Zen temple in Goma for more than 40 years. The building stems from 1784. It is straw thatched and is a National Registered Cultural Building, called “Kayabuki Ongakudo”. In March of 2017, Ernst passed away, but Kazuko has continued her own concerts with her “Musikalische Freunde” at Kayabuki Ongakudo twice a year. It takes about one hour from Kyoto by train to get there, and another 18 minutes to walk through rice fields to their home. The train ride offers exceptionally beautiful views of unspoiled landscape. The village of Goma is like something out of an old story book. There are some refreshments (omotenashi) served during the intermission（homemade cake and drink, as well as a rice ball (o-nigiri) ）for everyone at the end of the concerts. The green of the rice paddies and the mountains in Goma village are getting darkened by the rain. This autumn’s Kayabuki concert series [Seiler und Musikalische Freunde ] will be a Piano Trio Concert with Mr. Thiemo and Mrs. Erika Akane Schutter from Switzerland. Mr. Thiemo Schutter is a young, talented musician and is also an excellent musical instrument maker. In this performance we will play a violin and a cello he made himself. A good friend, Erica Schutter is like my daughter Kio’s little sister, her mother is Japanese and she is also living in Switzerland. After a hot summer, in September, a cool, refreshing breeze blows through the village of Goma, and the rice turns gold in the fields. We would be delighted if you came to see our concert and could invite your friends to hear us. *Replace [at] in the above mail address with @.